Gallery Nucleus is pleased to welcome special guests to talk about their work on Solo: A Star Wars Story. Join us Sunday June 3, 2018 as these talented artists share stories behind-the-scenes and sign the official Art of Solo: A Star Wars Story book. Bring your questions for the Q&A. 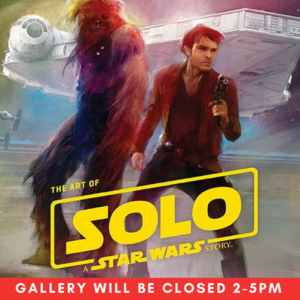 $5 ADMISSION or FREE ADMISSION with an Art of Solo: A Star Wars Story book purchase. Please note seats are first come first serve. Standing room will also be available. Due to the high attendance expectations, attendees will NOT be admitted after we have reached capacity, please plan to arrive early. Front Row VIP Reserved Seats available for $20 (does not guarantee availabilty of book for "seats only" option). Guaranteed seat in the first 2 rows, only 20 seats available. No need to wait in line or get to the event early just to get a good seat. Guaranteed first in line during the artist signing time.